Sport activities elicit fervent responses from people and the passion of players matches the excitement of spectators and fans. The global sporting industry is worth over $600 billion and with the amount of money circulating, major sport arenas boast impressive structures. Speaking of architecture some are more remarkable than others. 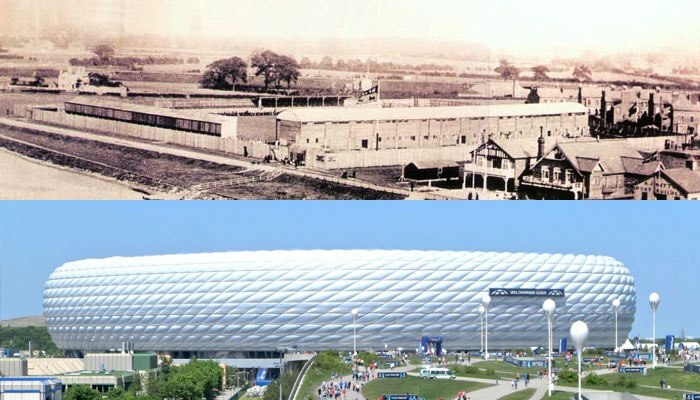 But, how did football stadiums look originally? How did they evolve? Who are the individuals who changed the pitches from the set aside grass areas to properly maintained stadiums? When Association Football was in its starting phase, people played their matches on spare playing fields, mostly within the public parks. The biggest worry of players was whether passers would understand exactly what was happening and have the courage to walk around the pitch. Harrow School Footer Field, aquarelle by Walter Cox. With growth of football popularity and professionalism, the need to develop better grounds where players would like to be arose. Football clubs started doing more than just brushing some debris off the grass and sending boys out for short matches. 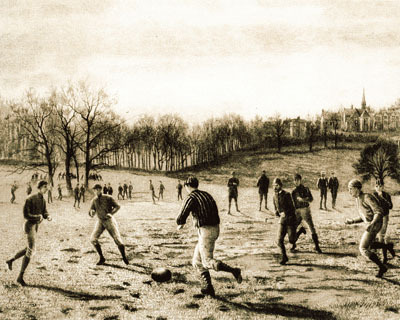 Ground that could be used for football and other games, like rugby, had existed for a while. 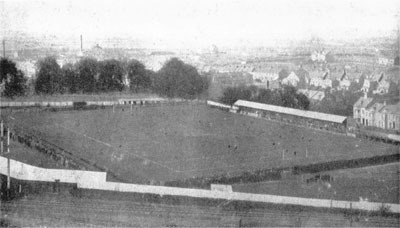 The very first ground, Sandygate Road, opened already in 1804. Almost 60 years later, the first football match between Hallam and Sheffield FC was played here. Initially, the markings you see on the local pitches were non-existent. Football pitches featured bollard or fence along the field edges to help players know where they could not go beyond and to keep the spectators closer. In addition to that, the fields featured two sticks, fundamentally, at each pitch end to represent the goals. It might seem strange to hear that football pitches were the suitable looking grassy areas. In most cases, it was the ideal section of the public park – the straightest part. As the popularity of this game increased, teams started using private land. For example, Preston North End moved in 1875 to Deepdale to play its matches on a ground that was formerly a farm, and considering the initial state of the field, they encountered numerous problems. Dunstable Road, the home for Luton Town FC 1897-1905. Before 1960, football pitches featured regular grass and people would not find anything to be excited about. Later in the 1980s, developers installed drainage systems in them. Originally, pitches required substantial amount of maintenance to keep them in the right shape. They were reliant on regular lighting and watering. In the year 1958, people witnessed undersoil heating put underneath the football-playing surface in Goodison Park. The twenty miles – roughly thirty kilometers – wire was laid under the surface, costing the football club over £16,000. The purpose of this heating system was to prevent freezing on the pitch and was more effective than the installers thought. And because the ancient drainage system could not cope with the new water floods, the pitch was taken up and relaid in 1960 and better drainage systems installed. Still, in the year 1960, people witnessed the introduction of first-generation artificial turf. The first-generation artificial turf was very different from the pleasant life-like artificial grass on soccer pitches today. It was low-piles, stiff nylon fibers attached to asphalt or concrete bases. It was first installed in Astrodome Texas. Professional footballers encountered artificial turf when Luton Town, Queens Park Rangers, Oldham Athletic and Preston North End introduced the second-generation turf to their fields in the year 1980. The United Kingdom government illegalized artificial turf in the year 1995. 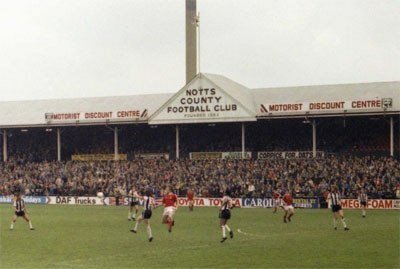 The game is on at the Meadow Lane in 1981. In the year 2001, UEFA and FIFA started quality assurance programs for artificial turf development. That helped them come up with industry standards for its use in the soccer world. And as a result, the International Football Association Board tackled the problem of turf in the 2004 Laws of The Game. 4G pitches, also known as fourth generation pitches, came into being in the year 2010 and their popularity has been growing. The pitches are a hybrid of natural grass and artificial turf and people can therefore use them for a very long time without any sign of wear and tear. The increased popularity of turf results from the improved image of The John Smith’s Stadium in Huddersfield. Deesso Grassmaster pitches are now common in our stadiums, but were laid for the first time in 1996 in the home of Huddersfield Giants Rugby League Club and Huddersfield Town Football Club. The benefits of artificial and real turf hybrid are clear. Maintenance problems that were common in earlier days are no longer a big problem. Football pitches are not lit or watered regularly and groundskeepers can easily monitor them. 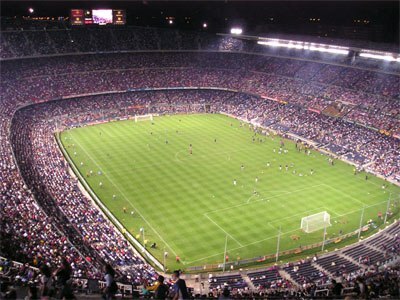 Football arenas such as Camp Nou in Barcelona, gives the sport events another dimension by their grandiose and spectacular framing. The stadiums have grown bigger and bigger, but on the same time the maximum attendances have decreased. The shift from standing places to seats has increase the safety a lot, but it also means that some old records, such as the 173,850 (unofficially, the attendance has been estimated to be over 200,000), at the Maracanã stadium the 16 July when Brazil played against Uruguay in 1950 World Cup will probably never be broken. 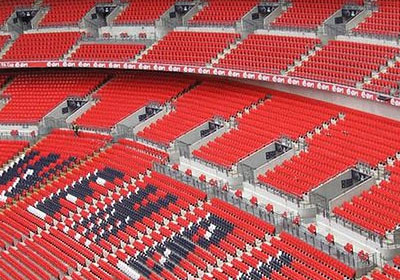 Typical interier design with rowes with seats in levels at Wembley Stadium. 1.,2. (collage image ) unknown.